Leave M5 at junction 10 (keep in right hand lane) onto the A4019 towards Cheltenham. Take 1st Right into Wythybridge Lane towards Gloucestershire airport. At T-junction turn right, following Glos a/p signs. At traffic lights go straight across into Bamfurlong Lane. Take 1st right into Bamfurlong Ind Park and ACC is on the 1st right-hand corner. Leave M5 at junction 11 and follow A40 towards Cheltenham. At roundabout/lights take 1st left, B4063, to Churchdown/Glos. At 1st set of lights (approx. 2 miles) turn left into Bamfurlong Lane, signed to Gloucestershire airport. Take 1st right into Bamfurlong Industrial Park and Any Colour Coatings is on the 1st right-hand corner. 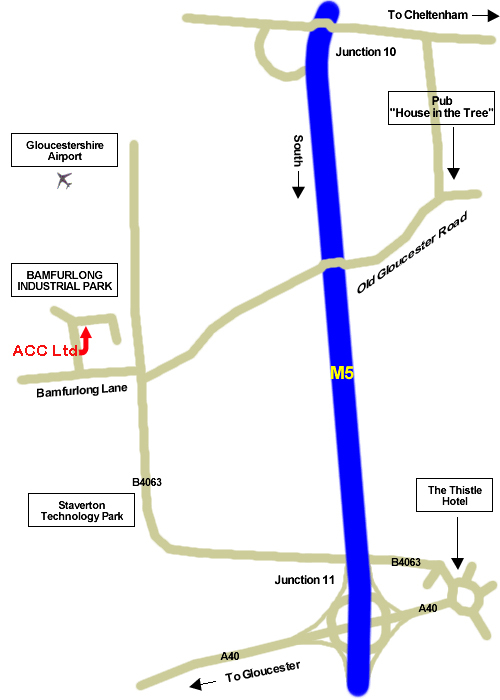 Bamfurlong Industrial Park is approximately a 4-mile taxi-ride from Cheltenham Railway Station and is served by the 94 bus (originating from the Promenade in the centre of Cheltenham).